What's that? Pierce Brosnan needs a new action franchise now, 12 years after his James Bond stint ended? There's a series of novels ripe for the action genre taking that would suit him perfectly? Let's make that deal. But The November Man, from the novels by Bill Granger, ends up being more than a run-of-the-mill spy thriller. Aided by some superb action directing from Roger Donaldson and a nice turn from its charismatic lead, the film trumps most of the recently standard "old guy in an action flick" turns we've gotten. Brosnan joins the ranks of Liam Neeson and Kevin Costner, and the former 007 prevails. Brosnan plays Peter Devereaux, a former CIA operative who has left his days taking out the bad guys for the good guys long behind him. He's enjoying a peaceful life by a lake in Switzerland when he's called back into the field. What begins as a simple assignment protecting a Russian informant, who also happens to be a former love interest, quickly becomes personal. It isn't long before Devereaux is going up against his former employers, along with the young agent (Luke Bracey) he once trained, and uncovering a conspiracy that has serious ramification for both US and Russian authorities. Needless to say a lot of heavily trained people have a lot of reasons to try and kill the man once dubbed "The November Man." That synopsis may read pretty sharp on the back flap of a novel, but it isn't exactly groundbreaking when it comes to the device driving an action film. CIA hitmen, government conspiracies, and "the one man who cannot be stopped" are all pretty commonplace when it comes to this sub-genre of film. To an extent The November Man doesn't transcend the blandness of its plot. It's loaded with red herrings and "surprise twists" that never really fool you or take you by surprise. Likely much of it played out fresher in reader's minds when the novel it's based on (There Are No Spies, the seventh novel in the series) came out in 1987. While the time between then and now has made all of its twists and turns standard, the screenplay from Michael Finch and Karl Gajdusek keeps the energy level high and the next batch of excitement never too far off. The cat-and-mouse game between Devereaux and his former student is intriguing at the very least, engaging in the moments it's all done right. The story even delves into the psyche of such an agent and the choices one must make in their life in order to be the best at what they do. It usually ain't pretty. Which is where the action in The November Man gleefully rests. Donaldson never shies away from the grittier side of the agents' business, F-bombs and blood-packed squibs both flying from the left and the right in the R-rated film. As with his last, big-screen outing, The Bank Job, the director brings a sophistication to the table that may not have otherwise been present. 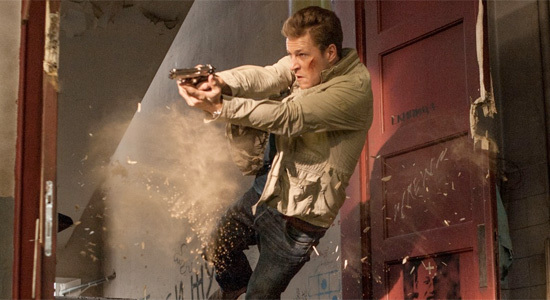 The November Man steps on the gas when it comes to the action, all the usual spy games and chase sequences appearing to have a fresh coat of paint based on execution alone. It also helps having the presence of Brosnan, an actor who exhuded sophistication long before he stepped into Bond's iconic shoes. He isn't winning any acting awards with The November Man, seeming to go at about half speed for the most part. He still acts circles around his supporting players, though, and moments where he really shines is when his character is allowed to be more than the morally righteous protagonist of an action plot. There is some Jack Bauer-esque grayness to Devereaux, and Brosnan, always keeping it cool and calculated, drives a solid nail when it comes to his character's darkness. All those glasses of hard liquor the character throws back may, in fact, be a form of method acting. Those supporting players, by the way, don't raise the film's grade even a millimeter, Bracey as the arrogant and audacious younger agent being one of The November Man's more frustrating aspects. It's not that Bracey is a poor actor or even does a poor job, but the part calls for so much more than the actor is willing to give. His vanilla plainness does a disservice to the character. Considering its importance, essentially a duel-protagonist along with Devereaux, an up-and-coming actor or even someone already established and with some serious acting chops would have done wonders for the film as a whole. Olga Kurylenko as a witness Devereaux must protect and Will Patton and Bill Smitrovich as CIA middle management are all solid in their respective parts, no one turning in anything that's eye-opening or worthy of remark. 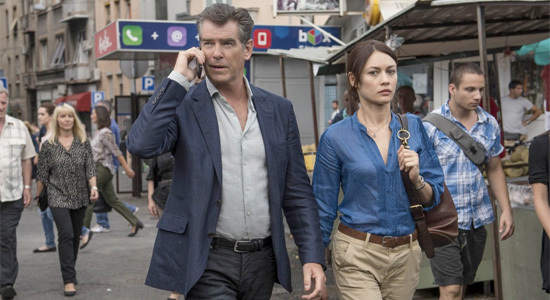 What The November Man has to boast is its action and Brosnan, a combination solid enough to keep the 007 franchise going for an extra seven years. One of these aspects alone and this film may have been just good enough to recommend, but with both together the filmends up standing tall above the average line. Brosnan's still got it. He and The November Man prove that, even armed with standard-issue equipment, the right hands wielding the right tools can and will produce the right results. I'm very surprised by this review. Haven't heard much about this...good review. hee! a nice review about a simple action movie.. Thanks! I really want to see this. I hope it becomes a franchise. Kurlyenko unofficial second time as a Bond girl? Haha. I really want this to be good. I will check it out. Thanks Jeremy. I can't believe I let this allude me!